When playing at an offshore casino site, it is important you stick with casinos with licenses issued by reputable gambling jurisdictions. The Kahnawake Gaming Commission is up there with some of the best, most trusted names in gambling jurisdictions – we explain more about this casino regulator, what it does to protect players and the best casino sites with Kahnawake certification. The Kahnawake Mohawk Territory is part of Canada, located south of the St Lawrence River in Quebec. It covers a small area of just 48.05 square kilometres and has a population of around 8,000 Mohawk (North American Indian) residents. It is one of several Mohawk Territories within Canada. Despite being part of Canada where it is illegal to operate an online casino, Kahnawake operates independently and is subject to its own set of laws. The Mohawk people have asserted sovereignty and jurisdiction over their territory, with the authority to license and regulate a gaming jurisdiction part of the sovereign rights for indigenous communities to govern their own affairs. 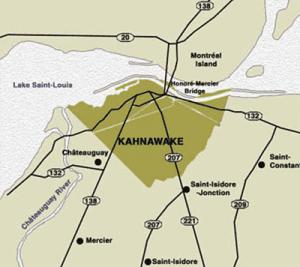 The Kahnawake Gaming Commission was set up in 1996 by the Mohawk Council of Kahnawake as part of the Kahnawake Gaming Law. It is the sovereign rights of the Territory which allows the jurisdiction to operate independently from Canadian law and since its establishment, the Commission or its legality has never been questioned by Canada or any other jurisdiction. In July 1999, section 35 of the Kahnawake Gaming Law was extended to include Regulations Concerning Interactive Gaming, which established the requirements for the Commission to issue online gambling licenses. Frank Catania, former Director of the New Jersey Division of Gaming Enforcement assisted the Commission with drafting and revising the new regulations for online gambling, which have been amended multiple times since to stay up to date with changing technologies. In 2016, the Kahnawake Gaming Commission made an agreement with New Jersey Division of Gaming Enforcement that it would no longer provide online gaming licenses to operators who accept players from the United States, where gambling at offshore sites is illegal. What does the Kahnawake Gaming Commission do? These principles are designed to safeguard security and fairness for players by ensuring operators are running above board and supporting responsible gambling practices. The regulations apply to all interactive gambling activities licensed within the Kahnawake territory, including gaming involving players located outside of the jurisdiction. This means players are protected by the Kahnawake Gaming Commissions regulations when playing at a Kahnawake certified site no matter which country they are located in. In order to gain certification from the Commission, a vendor must go through a strict application process including proof the company is of strong financial standing. Application fees upwards of $40,000 apply to casino software providers seeking licensing from Kahnawake, so players can rest assured operators seeking licensing from this jurisdiction are financially sound and prepared to go through the rigorous application process. Despite being one of the smaller and lesser known gambling jurisdictions, the Kahnawake Gaming Commission has provided licensing to some of the biggest online casino operators, including several of our favourites. It is worth noting many of the online casinos with certification from Kahnawake seem to also hold additional licenses from some of the more dominant gambling jurisdictions, like the Malta Gaming Authority, so the fact a site has licensing from Kahnawake is not always 100% clear. Keep in mind not all players from all countries are accepted by these online casinos. If you are unable to sign up with any of these sites it is probably because you have been geo-locked as these sites are not licensed to accept players from your country. For a list of the best casinos available in your area, refer to the casino table at the top of the page which has been geo-targeted to specifically suit your location. For a full list of the casinos holding a license from the Kahnawake Gaming Commission, you can check the official website which has a list of all Interactive Permit Holders plus the URL to the online casino in question.